Then someone comes and takes all your stuff." It's an old joke, I know. Maybe it's not funny, but it is true. My mom left this earth a little more than a month ago. She lived 84 years, the last 11 or so in a cute little house around the corner from me. For about 10 1/2 of those years, she bitched every day about needing to sell that house, needing to get out of that house, needing to get rid of all her stuff. Then, one day in May, she did. Put a For Sale sign right in the front yard. She had an offer the next day. She sold it to somebody else a few days later. The buyers, acquaintances of ours, told her to take her time moving and cleaning it out. 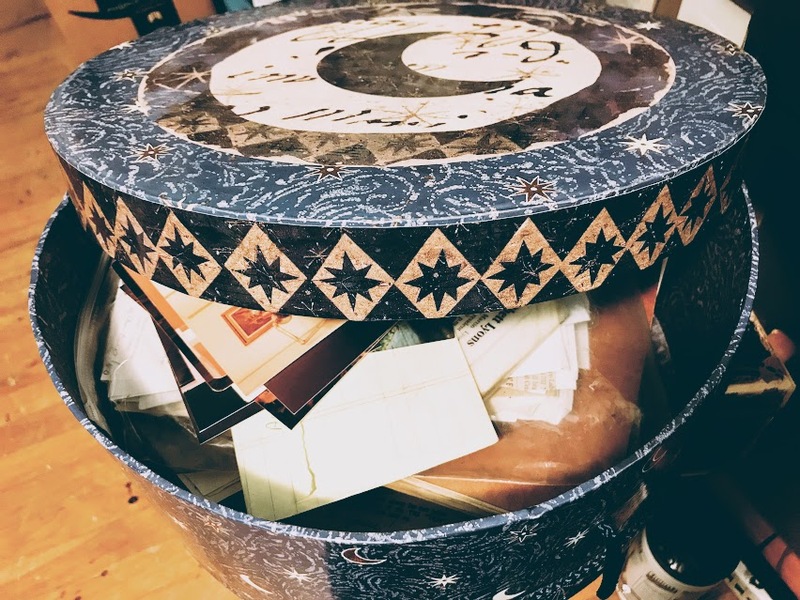 From May to August, Mom spent hours sorting through the remnants of her life, trying to decide what to keep, what to toss, what to sell, what to give away. She tried to give lots of it away, too. She managed to downsize enough that she was able to move into a nice little one bedroom apartment in May. But she wasn't there very long. It quickly became obvious to our family that mom wasn't going to be able to live alone. Her brain wasn't as sharp as it used to be. So in August, she came to live with me, in a pretty small bedroom. I told her to bring whatever she wanted; the rest we put in storage. After she was gone, I left it all alone until our family get-together, when I basically told everyone to take what they wanted. Then, I finally worked up the courage to start going through the leftovers, the remaining remnants of my mother's life. You think you know someone until you have to empty their junk drawers. Scotch tape. Rolls and rolls of it. Some of them empty. A letter I wrote to her for Mother's Day, thanking her for everything she had ever done for me. The eulogy I wrote for my brother's funeral, along with his accident report. My wedding and engagement announcements. Her divorce papers. All three of them. A check for $25 my grandmother wrote to her in 1979. Uncashed. Her elementary school autograph book, filled with those cute little poems we all used to know. It's all written in pencil, though, so it's hard to read a lot of it. A wonderful scrapbook of photos and clippings about former LSU football player Jim Shoaf. She and he were "friends" back in the day. I'd love to get this book to his family if anyone knows how to get in touch with them. A few of my sister's report cards. And, I think, every check register she ever kept. I sorted through it all, keeping some, tossing --- a lot. I could hear her in my head saying, "Don't throw that away! I might need it!" I now have a "Mama box," filled with her keepsakes. It's next to the two boxes that contain my own. And Lora's. And Marty's. I guess someday, someone will have to come go through my stuff, which will now include so my of my mom's and others. I'm guessing they will be very confused. They probably will wonder why I have six portraits of me. No, I'm not that vain. My mother was a painter and had me pose for her often. And her art classes. She also studied with the artist Henry Hensche and paid handsomely for him to do a "study" of me. But she was totally pissed that the one that I hung over my piano wasn't the one by her or him. They probably will wonder why I have all of my grandmother's genealogy notes. Well, that's because, when she died, mom gave it all to me to go through..... Yeah. I still have lots of it. They probably will find a few surprises somewhere. But no gall stones. However, they now know why I have so many pairs of scissors. Scissors must have been a luxury for the generation your mother and mine came from. I have several pair as well and cannot shed them. Bob asks how many I need. It just doesn't matter.